A small, well marked spider, but quite similar to related species so care needs to be taken with identification and detailed examination of the specimen may be necessary. This species is typically found on gorse bushes and heather on open ground, but can also be found on oak, blackthorn, nettles and thistles. Adult males have been recorded between May and August, adult females between June and October, and even on one occasion in December. It constructs an inverted cup shaped retreat, which it covers with plant debris. Below its retreat the spider spins a typical Theridiidae tangle web. 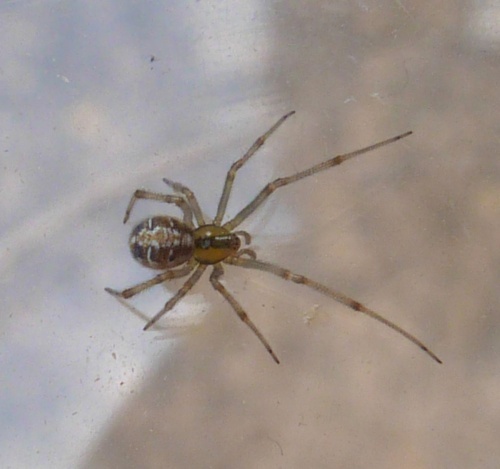 Theridion impressum is widespread especially in central southern England, but becomes scattered or absent in parts of the west and north, and is very rare in some parts of the east, including well-recorded counties such as Essex.